This poem is also a royal pain. This is the twin poem to yesterday’s post, Poem 10. So as a quick recap, twin poems are pieces written relatively near each other that inform the other in some way (usually non intentionally) and can help the true intention of the poem come to better light. For example, this poem went with the other because they are both about self-discovery, they focus on a flowing repetition and are free form and loose. My editing will try and make them tighter and more intentional, if that is possible. Same as the previous editing, this poem has seen lots and lots of versions and has had so much work done it could easily live in Beverly Hills (kidding). Instead I want to focus on repetition and why the marked up version is a poor demonstration of working repetition. First, repetition is not the enemy. 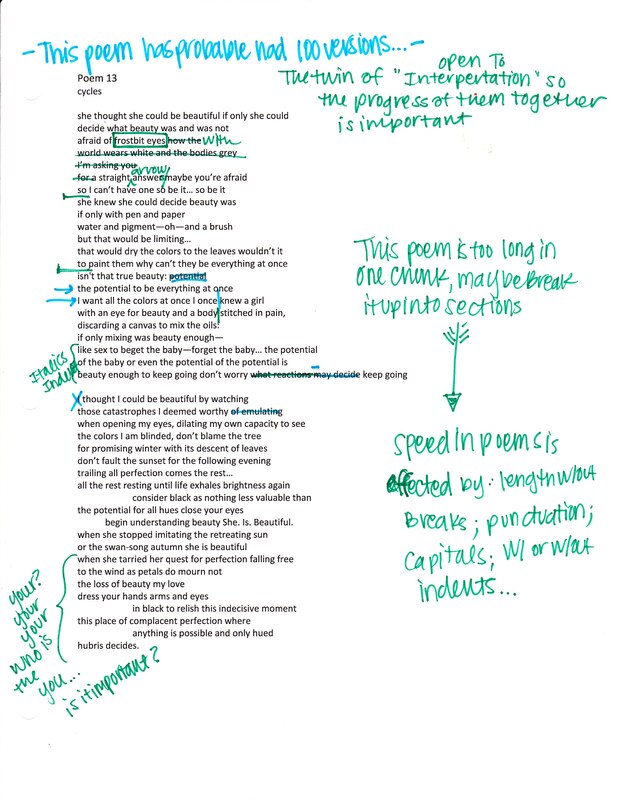 There are lots and lots of reasons to have a poem repeat, including but not limited to: style, emphasis, flare, contrast, rhythm, interest and tone. These are all perfectly good reasons to repeat correctly, though sometimes there are issues with the repetition structure itself that can bog down the intent. Here is a good steadfast rule for repeating, which will inform some of the changes I made today. Your poem must be 40% concrete—always, sometimes more. 20% can be commentary or reflection, which leaves 40% (or less) for the repetitive elements of the piece. That means that less than the concrete and brainy bits can be the rhythm or stylistic use of repetition. Before, I had about 10% concrete, 30% brainy/fluff (sometimes the brainy bits come out as dryer lint, don’t let this happen to you, edit quick!) and then a whopping 60% was repetitive phrases and throw away statements that locked together to make some sense of dull trance. It was not exactly a prize winner. The issue was in the ratio, but also in the choice of content. To make a poem a strong repetition piece the concrete needs to be super solid. It was a paper flimsy mess to begin with, not a good start. This poem will need more editing for sure, but the loss of some repetition and the addition of some concrete imagery was a good start.